Amillia Taylor is fighting for her life and the odds are against her. She was born at just 21 weeks into the pregnancy four months ago at Miami's Baptist Children's Hospital. With no baby born before 23 weeks surviving at length, Amillia has gone home to be cared for under the watchful eye of her parents. Taylor was just 284 grams (10 ounces) and 24 centimeters (9.25 inches) long when she was born and doctors typically say that babies weighing less than 400 grams have very little change of surviving. Babies born at full-term typically spent 37 to 40 weeks inside their mothers before delivery. 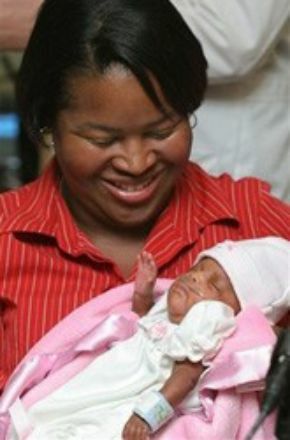 Her mother, 37 year-old Sonja Taylor, faced fertility issues and used in-vitro fertilization to conceive Amillia. But she battled problems throughout the pregnancy. Mother delivered baby at 21 weeks on October 24 and Amillia was barely breathing. Her parents named her for a Latin word meaning "resilient, fighter, hardworking." The resilient fighter hasn't given up and her parents told the media about their daughter's spirit. "I'm still in amazement," Sonja said. "It was hard to imagine she would get this far." "I wanted her to have a chance, and I knew in my heart that she was going to make it," she added. Dr. William Smalling told the Associated Press on Monday that physicians treating Amillia "weren't too optimistic. But she proved us all wrong." "She's going to be in a normal crib, she's going to have normal feedings, she's taking all her feedings from a bottle," Smalling said. Amillia has dealt with some breathing issues, very mild brain hemorrhage and digestive problems since her birth but none of them will cause any negative long-term effects. "We can deal with lungs and things like that but, of course, the brain is the most important," Dr. Paul Fassbach told AP. "But her prognosis is excellent."